The words cultivar and varietal are often used interchangeably (and incorrectly) around in the tea community. On this particular topic there is a ton of directly conflicting information and incorrect statements even amongst reputable sources. Knowing cultivars may seem ultra-technical and seem like impractical knowledge but it can be very useful (most importantly helping out in purchasing, understanding, and appreciating good tea). This article will examine all these issues, specifically in regards to Taiwanese teas. What is the difference between a cultivar and varietal? What constitutes a varietal? What about a cultivar? Varieties often occur in nature and most varieties are true to type. What does this mean for tea? What is a varietal and what is a cultivar? Simply put, there are only two varieties of tea that are of any relevance to tea drinkers: Camellia Sinensis var. Assamica and Camellia Sinensis var. Sinensis. The Assamica variety is larger and is used for Indian tea (usually Black Tea) while the Sinensis variety is smaller and is used for Chinese tea. There are exceptions to this, notably Darjeeling tea and even some Taiwanese black teas (more on this later). The naturally occurring varieties are surprisingly simple…now for the cultivated or man-made varieties…cultivars. One Varietal, Three Cultivars. Source: Mountain Tea. 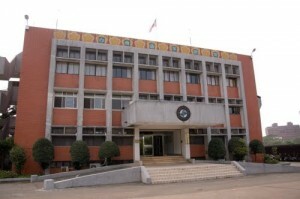 Around 1900 under Japanese occupation, a research institute for educating tea farmers and developing cultivars was formed. Japan’s goal was to make Taiwan into an exporter of black teas to the rest of the world. When Japan was removed from Taiwan after WWII, the Japanese occupation had already left an indelible mark on Taiwanese tea. The importation of the Assamica varieties (the introduction of black tea to Taiwan), the research institute which was named TRES (Taiwan Tea Research and Extension Station), and perhaps even the unique Oriental Beauty (Marshaln’s theory) are all artifacts of the Japanese presence. Post-occupation TRES remained active and has been responsible for many cultivars used for Taiwanese tea, including popular teas Jin Xuan and Cui Yu (Jade Oolong). Successful cultivars developed by TRES are given two different numbers for identification, i.e. Jin Xuan is 12 and 2027. Not just an old building. Taiwan Tea Research and Extension Station. Tea names are on their own quite confusing. Cultivars are often but not always used as the principal name for a tea (Jin Xuan, Tieguanyin) and naming conventions vary (high-mountain tea names usually refer to the tea-growing region, Baozhong refers to the processing method). One of the highest quality and most widely harvested cultivars in Taiwan, Chin-hsin was one of the original cultivars chosen by the Japanese to grow in Taiwan. It has a slower growth-rate than many of the newer cultivars developed by TRES. Chin-hsin is still used for most higher-end teas, including nearly all high-mountain gaoshan (Alishan, Lishan, Da Yu Ling, etc. ), Dong-Ding and Baozhong. Because of its exceptional quality Chin-hsin is especially dominant as you move to higher elevation tea. One drawback for farmers is Chin-hsin’s slower growth rate and lower disease resistance. Slower growth helps to develop further complexity compared with faster-growing cultivars. It can be a red flag if a high-mountain tea is not the Chin-hsin cultivar, a sign that the farmer might be cutting corners. Specifically look out for Alishan mountain Jin Xuan tea, which fetches a lower price than Chin-hsin Alishan tea and should be looked at differently. This is just a general rule and there are some notable exceptions. Editor’s Note: There are actually a number of different cultivars within this category. This is a common area of misinformation. For simplicity sake, these cultivars (Chin-hsin, Luanze, etc.) can be viewed as being somewhat similar. Chin-hsin Da Pa is not as popular as Chin-hsin and is predominantly used for Oriental Beauty. This cultivar is sweeter than Chin-hsin and produces a rich honey-like flavor. Chin-hsin Da Pa leaves are more oval. Chin-hsin Da Pa is also thought to originate from China and was introduced to Taiwan around the same time as Chin-hsin. Jin Xuan is the most well-known Taiwanese cultivars and is frequently sold by its cultivar name. Developed by TRES in the early 1980s Jin Xuan was alternatively named #12 or 2027 (by TRES). #12 is famous for its milky, creamy taste and fragrant smell; these characteristics making it a popular gateway tea for newcomers to Taiwanese oolong. Jin Xuan is also commonly sold as a flavored tea with additives enhancing the milkiness of the tea. A common trick practiced by disingenuous farmers/vendors is selling unflavored Jin Xuan as an unflavored tea. #12 is especially popular amongst farmers at lower elevations as it offers better disease resistance and a quicker growth rate (~20-40% faster) than the more premium Chin-hsin. Some high-mountain farmers will also harvest Jin Xuan on Alishan mountain (the most inexpensive of Taiwanese gaoshan) usually under 1600 meters. Jin Xuan Alishan will normally be a cheaper per oz. than Chin-hsin Alishan. Like Jin Xuan, Cui Yu was developed by TRES in the 1980s. Cui Yu is usually referred to by its cultivar name although it was also named #13 or 2029. While it’s slightly more difficult to find than Four Seasons or Jin Xuan amongst western-facing vendors, No. 13 is extremely popular in Taiwan and Asia and ranks as the third most consumed fragrant oolong. Cui Yu is only grown at lower elevations (Jade Oolong’s stem contains too much water for high-mountain growth) and offers significantly better yields than Chin-hsin. Compared with Jin Xuan, Cui Yu has a more floral and less creamy flavor-profile (both are extremely fragrant). Si-ji is grown primarily at lower-elevation and processed as a green-oolong, Si-ji or Four Seasons oolong was discovered by a farmer in Northern Taiwan (Muzha) and is thought to be a crossbreed between Chin-hsin and a Wuyi cultivar. Si-ji was named four seasons for its extremely fast growth rate, as it can be harvested up to six times a year. This makes it a popular and convenient choice for farmers. Si-ji, Cui Yu, and Jin Xuan can all be purchased at much lower-prices than higher-elevation oolongs. Flavor wise Si-ji has a stronger fruity aroma and taste than other popular Taiwanese cultivars. Alishan (Chin-hsin), Lishan (Chin-hsin), Baozhong (Chin-hsin), Four Seasons (Si-ji). Source: Floating Leaves. Tieguanyin in Taiwan is processed very differently from its more famous Chinese cousin. Frequently roasted and occasionally aged, Taiwanese Tieguanyin has a slower growth rate than all other commonly grown cultivars in Taiwan and is more expensive than all other Taiwanese cultivars. Tieguanyin is usually grown in Muzha (Northern Taiwan) at medium elevations and has a nutty, slightly floral flavor. Like Tieguanyin, Fo Shou is both a mainland Chinese tea and is sold as it’s cultivar name. Fo Shou is noted for it’s very large leaves Usually processed with a light roast, Fo Shou has a strong fruity flavor and a full body. It is most frequently found in Pinglin. Along with Chin-hsin Da Pa is commonly used for Oriental Beauty. When the Japanese established TRES the goal was to establish Taiwan as an exporter of black teas. This effort began with the introduction of the Assamic variety to Taiwan in the 1920s. After the Japanese left Taiwan black tea production fell considerably. While there is still minor production in the Sun Moon Lake region there are some extremely interesting versions of aged Taiwanese Assamica tea (1,2). Assam #8 was an early development by TRES and represents a refined version of the original Assam variety in Taiwan. This cultivar is still used, although the newer Ruby #18 is a more popular black tea cultivar in modern day Taiwan. Developed by TRES in 1999, Ruby #18 is a cross between a local Taiwanese wild strain and the Assam variety. #18 is grown at a low elevation in the Yuchi township near Sun Moon Lake (near the original black tea production). Naturally sweet, Ruby #18 is a great everyday tea and is the most popular black tea cultivar grown in Taiwan. How Does This Help Me?? While this article is largely a chance for us tea freaks to nerd out and build our knowledge base there are a few practical reasons to knowing your cultivars beyond impressing the opposite gender. Watching out for common tricks like flavored Jin Xuan. Don’t pay high-mountain prices for cheap, low-elevation cultivars. Flavor identification. OK, this one can get kinda nerdy. Similar to the Taiwanese Oolong Compendium, this guide is a compilation of some of the great sources on the internet. Please check them out. This entry was posted in Article, Long-form Article, Oolong, Taiwanese Oolong, Tea Learning and tagged Floating Leaves, Iowa State Horticulture, Tea from Taiwan, TRES, Wikicha. Bookmark the permalink. Thank you for this article and all the videos on youtube! As I’m new to taiwanese oolongs (and blacks), I’ve discovered a lot of new things while reading it. Very cool article! I just came back from the tea market here in Taiwan, where I saw a name “white tailed monkey”. Had no idea what it was. The vendor explained that it’s oriental beauty. Your article now explains it fully.Thanks a lot! Glad to be of service Alina! Safe travels and I’m jealous that you are in Taiwan :). The benefits of this article you wrote are still being felt everyday! A friend and I just perused with great interest and learned a lot! Thanks for your efforts as always. Great article! I just came back from 3 weeks in Taiwan. Managed to get round quite a few of the tea growing regions/farms and get a good look at some of the cultivars. Came across the interesting TTES #21 Hon Yu, cross between Keemun and a Nepalese assamica from Kyang. Thanks Alan! Sounds like you’ve been having some fun tea adventures :).